JUCHEREAU DE SAINT-DENYS, CHARLES, (known between 1689 and 1698 as the Sieur de Beaumarchais), lieutenant and captain in the colonial regular troops, first lieutenant general of the royal jurisdiction of Montreal, receiver of beaver for the Compagnie de la Colonie [see Charles Aubert de La Chesnaye], trader, entrepreneur, founder of a tannery on the Ohio River; b. 6 Dec. 1655, baptized 25 December at Quebec, second of 12 children of Nicolas Juchereau* de Saint-Denis and Marie-Thérèse Giffard; d. 27 Aug. 1703 in the Illinois country. On 21 April 1692 Charles Juchereau married Thérèse-Denise Migeon (1678–1748), daughter of Jean-Baptiste Migeon* de Branssat. They had five children. The Branssat family connections soon worked to good effect; on the death in 1693 of Jean-Baptiste, who had been nominated first royal judge of Montreal, Saint-Denys, an officer in the same company as Alphonse Tonty and Pierre Legardeur de Repentigny, was recommended as “one of the most capable persons who might be chosen” for the newly created office. One advantage of this position was that it afforded a knowledge of the fur trade, in which Saint-Denys was becoming a leading figure. Though complaining of his limited revenue, Saint-Denys, with his wife and his sister, Charlotte-Françoise Juchereau, made frequent loans to western traders; in 1693 they loaned 6,996 livres to Henri Tonty and Dauphin de La Forest. Stricter regulation of this trade in 1696 made it necessary for Saint-Denys to obtain leave from his duties as judge to represent the merchants in Paris in 1699. He returned the following year to help found the Compagnie du Canada for the export of furs, and became receiver of beaver at a salary of 6,000 livres – a vast increase over his stipend as judge. [See Antoine Pascaud.] Further regulations again brought Saint-Denys to Paris in 1700 to protest the royal policies. Instead of relief for his associates, however, he secured a concession, largely through the influence of the Comtesse de Saint-Pierre, to establish a tannery on the lower Ohio. The concession granted to Juchereau carried several conditions. He was permitted to secure any skins for tanning or bleaching except beaver; violation of this clause would mean forfeiture of the concession. He might be absent from his judgeship for three years, selecting two agents to remain behind and supply the expedition or to go in his place. He could take 24 men in 8 canoes, with all necessary supplies, including brandy for his men but not for sale to the Indians. Tan-yards and buildings could be erected wherever necessary. He could mine any deposits of lead or copper. A chaplain approved by the bishop of Quebec or by his vicar general was to go with the expedition. The scheme drew prolonged objections from Juchereau’s colleagues in the Compagnie du Canada, who, perhaps from personal experience, predicted the many abuses he could practise. They complained that the new agreement would “complete their ruin,” and urged that the Illinois country not be included as part of Louisiana. 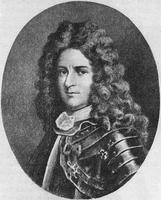 Pierre Le Moyne d’Iberville, however, who was married to Juchereau’s niece, welcomed this increase in his sphere of influence, and even sent soldiers to assist the venture. The party quickly established communications with Louisiana and engaged Mascoutens, and possibly some local coureurs de bois, as hunters. They built a fort about two leagues from the mouth of the Ohio, the exact site of which is not known, although several suggestions have been put forward. They probably established posts throughout the vicinity; one may have been on the site of Fort Massac (1757–1814), and the legend of a massacre at this place may have had its origins in some misfortune dating from Juchereau’s time. With Saint-Denys’ death in 1703, perhaps from the epidemic that swept the Mascouten tribe as well as Louisiana, the venture disintegrated. François Philippe de Mandeville, one of the survivors, attempted to salvage an accumulation of several thousand skins – including buffalo, deer, bear, roebuck, panther, and wolf – but many were stolen by the Indians, damaged by moths, or lost in a sudden flooding of the river. Some 30 survivors of the epidemic finally descended to Mobile; but others joined the unlicensed bands roaming the colony, and some even requested passage to France for their furs. In 1704 Le Moyne* de Bienville complained that the Indians were killing those who remained, and stated that they were “very good men, suitable for this country” if they would only settle somewhere. Apparently they never did, but the idea of a tannery intrigued French officials for many years, and various sites of the “ancien fort ruiné” appeared on maps for decades. 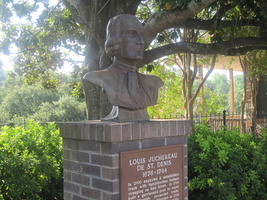 Juchereau’s brother Louis* was in charge of the tannery after the departure of Mandeville; Louis had come to Louisiana with Iberville and was prominent in its affairs until his death. 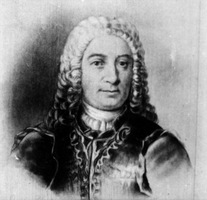 Juchereau’s son, Joseph-Charles (1696–1765), may have accompanied Louis on an expedition to Mexico. Saint-Denys was probably sincere in wishing to establish a permanent French settlement, as well as a tannery for quick profits. Had he been successful he would have served the colony as well as himself; a firm nucleus of French power in the Illinois country at that time might have drastically altered the course of empire west of the Alleghenies. AN, Col., B, 22, ff.17.264v–65v; C11A, 36, ff.402–3, 411–12; C13A, 1. ff.241–42, 449–64v; C13B, 1. Charlevoix, History (Shea). “Correspondance de Frontenac (1689–99),” APQ Rapport, 1927-28, 178, 1928-29, 380. Découvertes et établissements des Français (Margry), IV, 478–79, 487, 586–92, 625–31; V, 349–68, 425–26, 438–39. Documents relating to Canadian currency during the French period (Shortt). Ill. State Hist. Lib. Coll., XXIII. JR (Thwaites), LXV, LXVI “Un mémoire de Le Roy de La Potherie sur la Nouvelle-France adressé à M. de Pontchartrain, 1701–1702,” BRH, XXII (1916), 214–16. MPA (Rowland and Sanders). NYCD (O’Callaghan and Fernow), IX. Recensement du Canada, 1666 (APQ Rapport), 61. DCB, I. É-Z. Massicotte, “La famille Juchereau de Beaumarchais et de Saint-Denis,” BRH, XXXVI (1930), 528–29; “Répertoire des engagements pour L’Ouest,” 206–7. Tanguay, Dictionnaire. Alvord, Illinois country. Giraud, Histoire de la Louisiane française, I, II, III. P.-G. Roy La famille Juchereau Duchesnay. N. W. Caldwell, “Charles Juchereau de St. Denys: a French pioneer in the Mississippi valley,” Mississippi Valley Hist. Review, XXVIII (1942), 563–80; “Fort Massac during the French and Indian war,” Ill. State Hist. Soc. J., XLIII (1950), 100–19. [Both articles by Caldwell may be considered definitive; the one on Fort Massac is the first of a series of three.] J.-J. Lefebvre, “La succession de Charles Juchereau de Saint-Denis (1655–1703), premier juge royal de Montréal (1693),” APQ Rapport, 1959-60, 233–73. P.-G. Roy, “Charles Juchereau de Saint-Denys,” BRH, XXXII (1926), 441–42. John Fortier, “JUCHEREAU DE SAINT-DENYS, CHARLES,” in Dictionary of Canadian Biography, vol. 2, University of Toronto/Université Laval, 2003–, accessed April 20, 2019, http://www.biographi.ca/en/bio/juchereau_de_saint_denys_charles_2E.html.